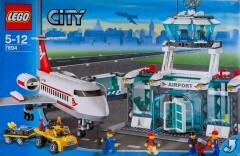 Today's random set is 7894 Airport, released in 2006. It's one of 33 City sets produced that year. It contains 700 pieces and 5 minifigs, and its retail price was US$79.99/£69.99. It's owned by 2773 Brickset members. If you want to add it to your collection you might find it for sale at BrickLink or eBay. This was about the time when airplanes got larger, and airport buildings got ... breezier. There's the revolving door, the two large widows at the front ... and then nothing but columns holding up the ceiling. Don't get me wrong, the above-ground tunnel to get passengers into the plane was very cool, but the traffic controllers must need rappelling equipment just to get to work. Still like the classic yellow airport better... Besides it came with a full runway. Who doesn’t like a runway? @Zordboy I think I see stairs on the side, though. First RSOTD that I have for a while. This was gotten X-mas 2007, only $44.99 at Target's BF sale. Let's just take a moment to note that the reign of yellow technic is over, and Huwbot has thrown in a fairly vanilla set we'll have forgotten by next week. @The Teenage Brickster ... Fascists. That's who. The rotating baggage claim was absolutely my favorite feature of this set. I can never get used to the sight of these huge Play Mobile style planes. Why so big? I like the pieces used in the airport though. I can see myself using them in various MOC projects, mostly involving space themed MOCs. Playmobile callled..... They want their plane back! Uh, because planes ARE big? I for one welcomed the new scale we got with City (4 wide cars, 6-8 wide trucks, bigger planes, even bigger container boats). This airport is on my wanted list, but I can never get to it because there is always *something* more pressing to get. My very first Lego set, it’s the reason why I’m on this site!!! I have it and I can tell it's a really good set: certainly better than 2016 City airport. People often forget that City sets are always meant to be playable toys which are easy for 10-year-old kids to put together. The airplane pieces are big and obvious for sure, but there's a reason for that. There's no way anyone would be able to create a good-looking modern plane (with interior space) with normal parts - special elements are required. People should just get over the fact that LEGO will create big pieces where necessary. You just can't make a plane this good without special elements! From the image, I don't really like it. It doesn't really look like a cohesive whole. When I was a kid I got 6396 International Jetport and I would probably rate it better than this one. One of the first Lego sets I remember. I was probably five when I got it. I don't remember why, but I thought the building was super cool. Maybe it's the revolving door. That wing piece gets in the way a lot now though. The older-style airport sets followed the typical design of the time: the buildings, vehicles, and planes were small and not even close to minifigure scale, but we didn't care because...well, just because LEGO! When Town morphed into City, the vehicles became 6-wide and generally larger, and the planes followed suit. Now you have a somewhat closer-to-minifig scale, at the cost of having less room to display your big airport, no more official runway and taxiway baseplates (the big planes don't fit on them), and, of course, a higher cost. Which design style is better completely depends on your point of view. I have most of the airport sets from both Town and City eras, and while the City planes look more realistic the airport layout is much easier to display with the Town sets. This is my favorite airport. I had to sell my 2010 airport, when I've finished the build I was so dissapointed with the scale, or lack of it. Huge aircraft, small terminal... I do prefer the 80's and 90's airport sets, the scale looks very accurate. Ohh, and the runway please!! Was this one of those sets where they took several different sets and packaged them together as a product collection, or does it just have a weird box image? If it's the former (which it doesn't seem like unfortunately) I love when LEGO does that. It's nice to buy all the sets that go together in one place, great for creating a scene or splitting up the build experience over multiple people. Has anyone that has access to Lego people ever asked why is it that baseplates are disappearing? We used to have printed baseplates and raised baseplates in all shapes and colors (well, just a few colors). Why no more? Why? @Zordboy: Very fair criticisms. That said, I feel like a lot of the older (2005–2007ish) LEGO City sets in general tended to be a lot weaker than some of the more recent ones, as they hadn't quite broken free of earlier World City design standards. Just look at how different #7237-1, #7240-1, #7243-1, and #7292-1 look compared to more modern counterparts like #60130-1, #60215-1, #60076-1, and #60204-1. As impressive as some of those older sets were in terms of size and price, their heavy reliance on huge chunky pieces and simplistic building techniques was apparent not just in the sets' shockingly low piece counts but also their outward appearance. Airports in particular have likewise improved considerably since then, with #3182-1 and #60104-1 both being conspicuously less gappy from the front, if still relatively shallow builds. @TheTeenageBrickster: I mean, I don't mind a runway, but at the same time I can't say I miss airport sets having them. For the most part they just make the sets cost more and take up loads of space without adding much to the building or play experience. In general, I like how sets in recent years have moved away from devoting a lot of their footprints to what essentially amounts to empty space, when most of the time there's just as much fun in landing aircraft, driving around cars, or acting out battle or chase scenes on the floor or a table. Especially since in many cases this has enabled LEGO to add bigger and more elaborate builds to sets at a lower price. Like, to cite an example from another theme, #6086-1 is tall and imposing-looking from its front and right side, at least, but its back and left sides largely consist of battlements that barely rise any higher than the preformed base. What's more, it has less than 600 pieces and a rather pitiful 32x32 footprint for $85 (around $155 in today's money). By comparison, even the much maligned #70404-1 from 2013 is fully enclosed by a wall 9 bricks tall, has a 44x32 footprint, and contains nearly 1000 bricks for $100 (around $110 in today's money). It's also customizable, with wall segments that can be rearranged or even combined with other sets like #7946-1 or #70402-1. It's doubtful it could have achieved any of those things had a substantial portion of its budget been devoted to raising its foundation, filling out its center, and constraining its shape with one enormous, frustratingly fragile baseplate. This has been asked at least once. In LEGO's opinion, baseplates limit the play experience. They are big and clunky and when a set is built on one, it's hard to move the sections around. Baseplates are also expensive to make (especially if printed) and prone to breaking. I do agree that baseplates are cool and often really add to the look, but fortunately will still have normal baseplates available in stores. I find your loathing about one of the greatest Castle sets unreasonable. Do you even own the set? If you did, you'd know that a lot more care and love was put into 6086 than 70404, making it look a lot more charming and sensible. You should also consider that 6086 is not even meant to be as voluminous as 70404 and that 70404 is a big downgrade from 7094 King's Castle Siege. Don't have this set, but I have 7893, and I made a really cool realistic MOC with 7498. The image shown is the pictures from the instruction books. I assume Brickset doesn't have the box image. @TransNeonOrangeSpaceman: I didn’t mean for anything in that post to come across as loathing! But any LEGO set is a product of its time, and I feel like raised baseplates in particular tend to exemplify the way that the baseplate-heavy design standards of the late 80s and early 90s could detract from how much actual building they had to offer. I chose this particular set for my comparison BECAUSE it’s such a great design for that time period, and thus there’s no mistaking that the weaknesses of the set in question are mostly due to the baseplate, and not any lack of skill or creativity on the part of the designer. Whereas a lot of the baseplate-heavy sets I DID own as a kid (like Neptune Discovery Lab, Shark’s Crystal Cave, and Fire Breathing Fortress) struggle to hold up by today’s standards for any number of OTHER reasons. That said, it’s awfully presumptuous to act as though either of us could have any way of knowing how much more love and care goes into any set than any other. Not liking a set is not somehow an indication that the designer didn’t give it their all. I profoundly admire Niels Milan Pedersen, who not only designed 6086,, but also lots of OTHER sets and parts I thoroughly enjoyed while growing up. I have no doubt he did his best to work with the constraints inherent to that set’s raised baseplate. But I also have no doubt in my mind that the designer of 70404, whose name I don’t even know, did their very best to make sure it both upheld the legacy of previous LEGO castles and implemented new ideas that would make it fresh and exciting for a new generation of fans. As for #7094-1 , again, I greatly prefer 70404, but in this case for different reasons. 7094’s use of train windows and mountain bricks is both creative and highly effective, and it has a very strong fantasy aesthetic in many regards, but a lot of the stuff in that set like the cantilevered tower and tilting bridge look tacked on due to the terminus of each arc sticking so far horizontally from the tower that’s meant to be supporting it. Also, like the airport that was the subject of this post, it is still only just beginning to shake away the design philosophy of the theme that preceded it (in this case, Knights’ Kingdom II), as evidenced by the extremely happy structure of the throne room, treasury, and prison tower. Both the two subsequent King’s Castle sets (in 2010 and 2013) enclosed their towers at least on enough sides that the throne and treasury weren’t sitting wide open from both the front AND the back! And while this set had a modular design, it did not have nearly as much freedom to rearrange the individual modules as its successors, which separated into six modules each rather than just four. But again — and I do not state this lightly — King’s Castle Siege was outstanding for its time, and holds up reasonably well in hindsight. Subsequent sets have simply built on some of its more successful features while doing away with some of its weaker attributes. Furthermore, some of the relative strengths of various castles will invariably come down to personal taste, because they aren’t intended to be the same style of castle, and some people might very well prefer the more fantastical, seemingly gravity-defying design of 7094 over the more grounded architectural style of the Castle series that followed it. I will admit that my personal favorite LEGO castle, #41180-1 , is stylistically more akin to 7094 than any subsequent castles on account of its cantilevered potion lab, open-air throne room, tilting bridge, integration into its rocky, mountainous landscape, etc. But I think it succeeds at these things in ways that King’s Castle Siege did not and in some cases perhaps even COULD not, such as using curved slopes that didn’t exist in 2007 to make the arc of the cantilevered platform (in that case in the form of a tree branch) continue more smoothly into the facing wall. Regardless, I have no doubt that the designers of all these sets put great effort into their work (you simply don’t get hired as a LEGO designer to begin with if you don’t! ), and I think they’re all deserving of praise. I do not think acknowledging the ward design has progressed necessarily means that newer sets are better in all respects than their predecessors or that older sets don’t have strengths that today’s designers would do well to consider moving forward. But in the case of some very particular attributes of older sets like baseplates that take up as much or more space individually as what’s actually built into them, I think it’s just as well that designs have evolved past them.